Farmer Cindy is the chief vegetagble grower, picker, packer, seller on the farm, although her first love is her collection of critters. At last count that was 1 horse, 2 donkeys, 2 goats, 6 rabbits, 15 chickens, 3 cats and a dog. 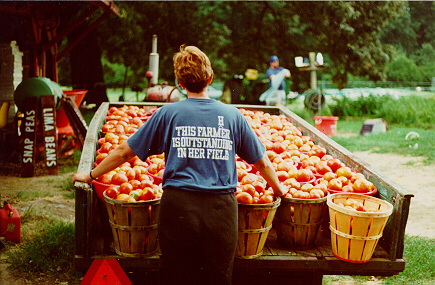 Cindy has been farming full-time since 1983. That year she quit her job with the MD Dept. of Natural Resources and together with Rick grew about 7 acres of vegetables. They sold them from a folding table under the big tree on Linthicum's farm across the road. Cindy has some farmin' in her blood. She tell stories of helping her grandfather who farmed the same ground she is farming now. She loves to sit on the porch of the old farmhouse and look out across the fields of green and watch her horse, Troy, in the field across the road.